I like to go out for New Year’s Eve. I love the energy, the people watching, the ridiculously tiny dresses that women wear when they are absolutely freezing (um, common sense?). I used to go out dancing on NYE with friends. Michael isn’t much for dancing or clubs so when we got together our tradition became going out to a nice restaurant. Last year we went to Meriweather’s on NYE and had a lovely dinner.This year we did something a little different. 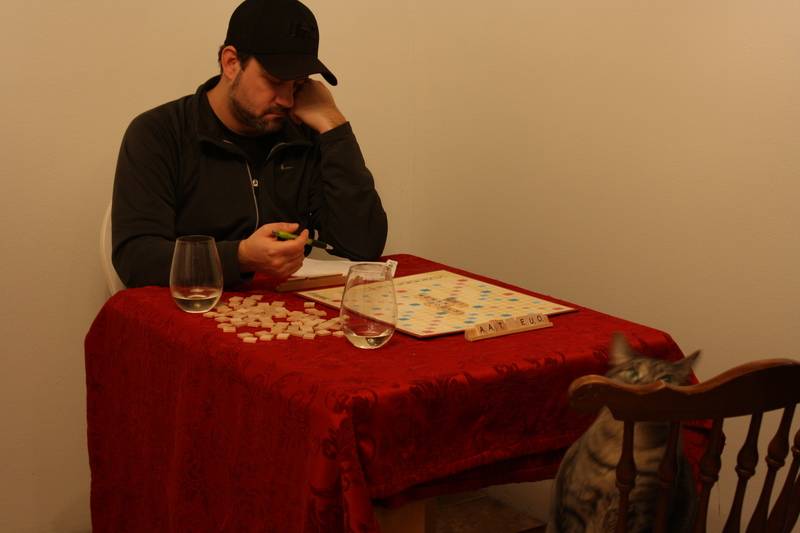 We stayed home and cooked a nice dinner together and then played a REAL game of Scrabble. Ham. I attempted baking a humongous ham for the first time in my life and it was AMAZING. It was a scary endeavor, especially on a holiday where the potential of ruin was high…but as Michael said, “It doesn’t matter. I don’t care if we eat Taco Bell tonight. We’re together and that’s all that matters.” Awww. 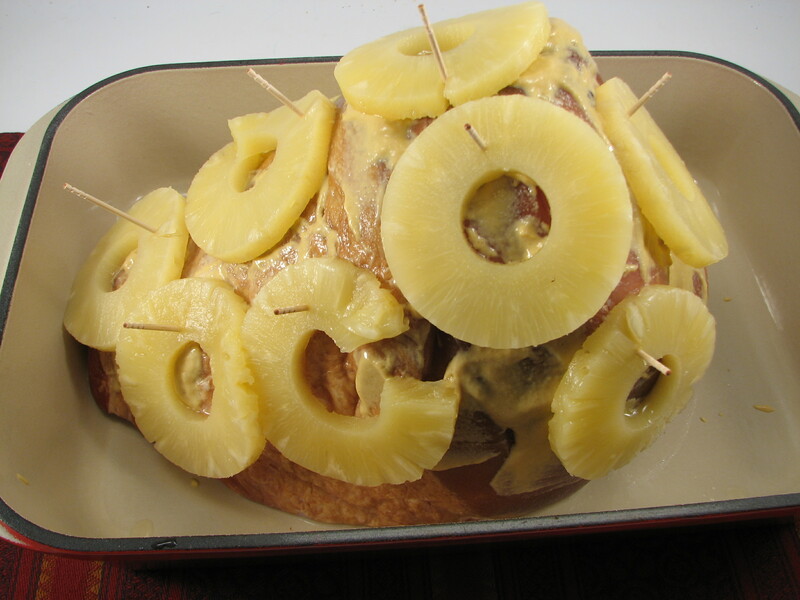 The recipe I found for the ham was pretty easy, considering I was holding a huge hunk of meat in my hands weighing more than 7 pounds… I scored the ham, slathered it with Dijon mustard, stuck the pineapple slices and cloves into it and popped it into the oven for 3 hours. Preheat oven to 325. Line a roasting pan with heavy duty foil. To prepare the glaze, combine brown sugar, allspice, pineapple juice in a small bowl. Mix. Score the ham with a small knife. Spread mustard over the ham. Attach the pineapple rings to the surface in an attractive pattern, securing them with toothpicks (use whole cloves to cover the holes). Brush with half the glaze. Bake, basting with the remaining glaze every 15 minutes until ham is nicely browned and the thermometer reads 140F. Cover with foil and let stand before slicing. I think the calories are off on the recipe, so don’t go off what it says. If you know WW recipes, try and figure out the actual points for it. Either way, I wasn’t too concerned about the points or calories that night. I didn’t have Allspice but I looked it up and you can do a mixture of nutmeg and cinnamon instead, so that’s what I did. 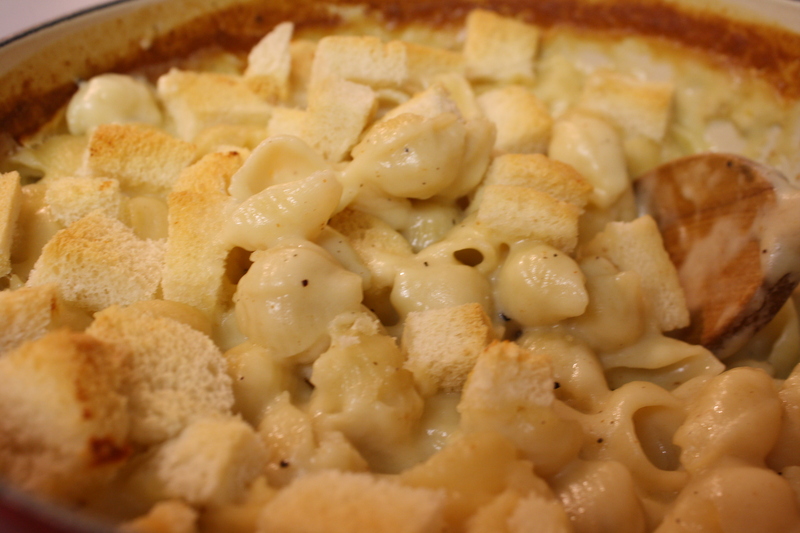 Michael had been craving his Mac n’ Cheese for a week too, so he decided to make mac n’ cheese to go with the ham. The flavors were great! Mac n’ cheese and ham and brussel sprouts? Yes please! 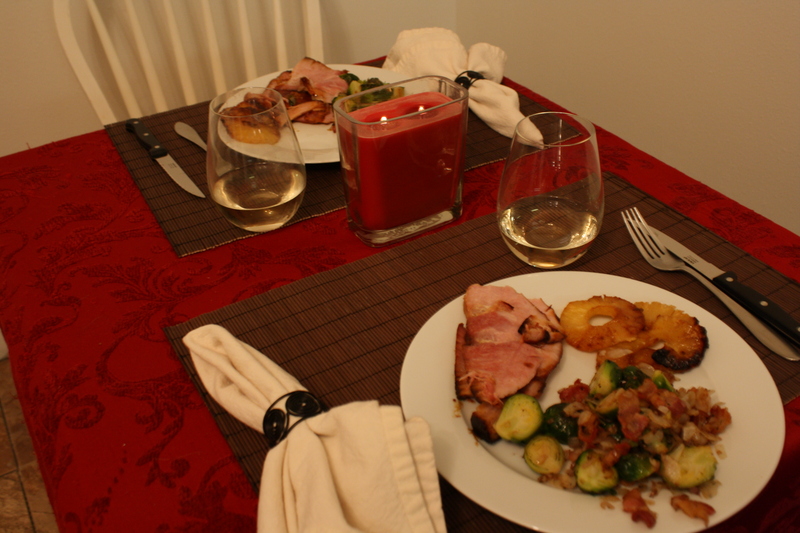 The ham was so tender and flavorful, I cannot stop raving about it. Add oil to the pan and heat over medium heat. Add onion and cook, stirring often, until soft but not browned, reducing the heat if necessary, about 4 minutes. Stir in thyme (or savory) sprigs, salt and pepper. 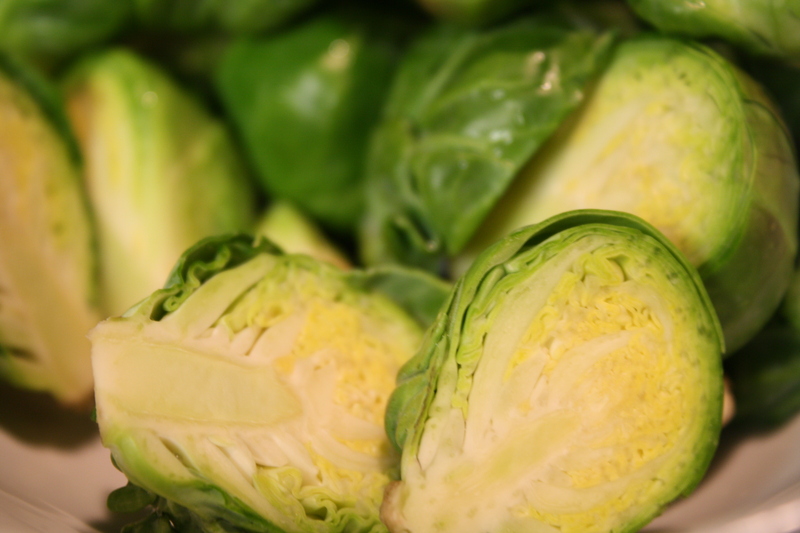 Increase heat to medium-high, add the Brussels sprouts, and cook, tossing or stirring occasionally, until tender and warmed through, about 3 minutes. Remove the herb sprigs. Add the bacon, thyme (or savory) leaves and lemon juice, if using, and toss. I have to say that our New Year’s Eve Dinner was probably the best meal I’ve ever cooked. After eating some amazing Brussel Sprouts in the last month, I knew that there would be some of those tasty green balls on our NYE plate. The recipe was simple and delicious. I chopped all the onions and added some shallots to it, chopped up chunks of uncooked bacon. Michael cooked the stuff in the skillet in the bacon fat. Bacon fat. Mmmm. While we were eating dinner I mentioned that I just realized we were eating ham AND bacon and Michael said “That’s why I love you.” Either way, double pork or not, everything went together really well. It was a nice stay-at-home-holiday. 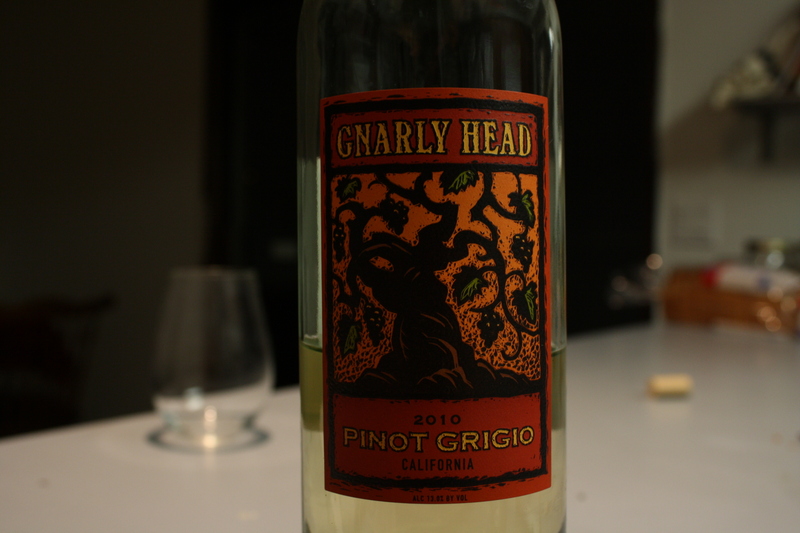 Wine was Gnarly Head Pinot Grigio–one of my new favorite California wines. 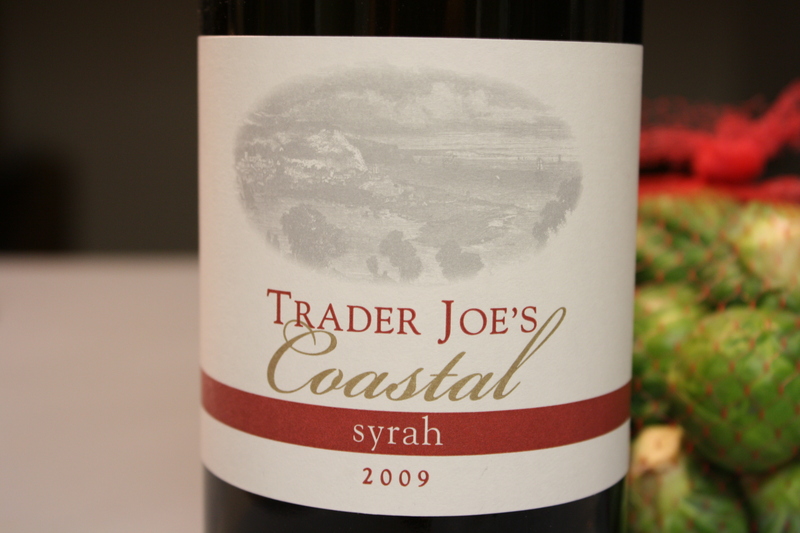 While we were cooking we enjoyed the Trader Joe’s Coastal Syrah–love! By the way, the Trader Joe’s wine was super cheap and probably one of the better wines I’ve had in a really long time. It was totally worth a try. I think my readers should give it a try! Go to your nearby TJ and spend $5. After dinner we set up Scrabble and played a game–for real. Not Words with Friends. 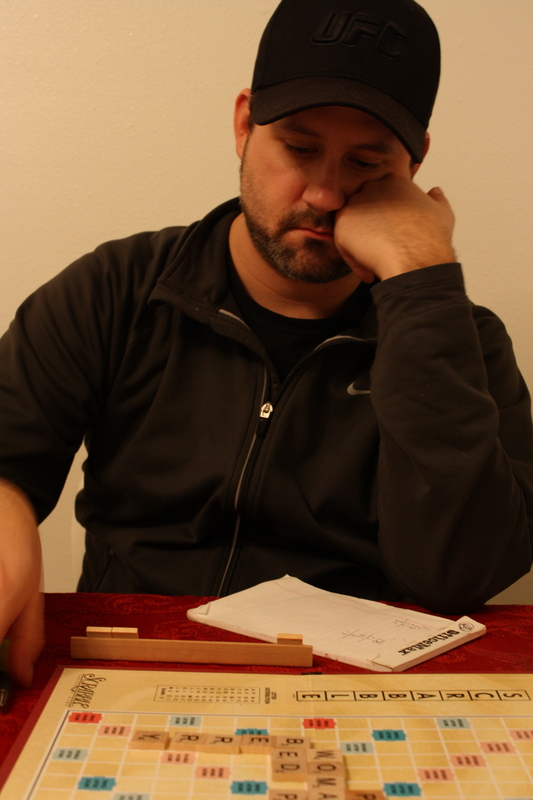 Michael gets super serious about Scrabble (well most games, really). I just play for fun. Since Michael was taking so long to make his moves, I played with Fat Kitty and my camera until it was my turn. 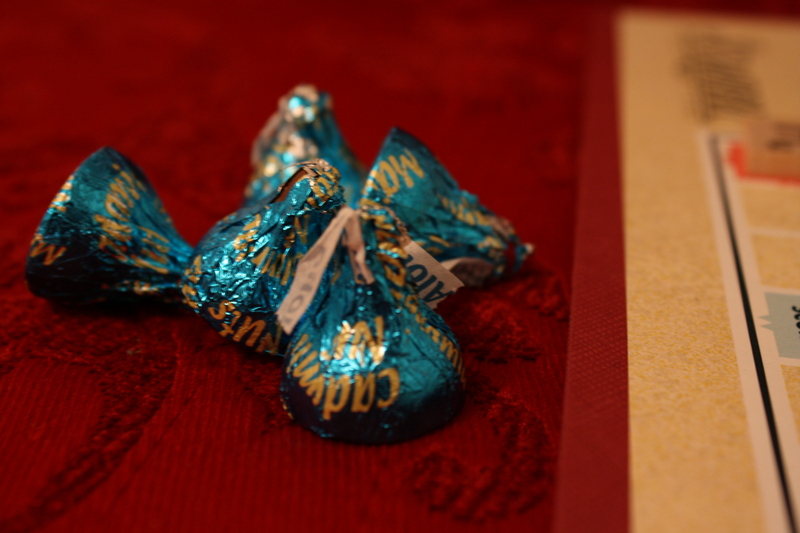 Waiting…waiting…and still waiting…And then I had some macadamia nut Hershey’s kisses for dessert. We definitely rang in the New Year on a positive note. Give these recipes a try–they were wonderful. Cheers! QUESTION: Have you ever baked a ham on your own before? What did you do for New Year’s Eve? I’ve never made a ham! But I do love the holiday sales on ham-so cheap and I love fried ham for breakfast, or diced ham in split pea soup. kalin recently posted..The Terrorists Won. This was my first time. I never attempted it because it seemed hard and really involved. It really wasn’t! It was a lot easier. I loved the flavor too. I make a ham every NYE, but without the brown sugar. I use the sugar free maple syrup. Yum. We had people over this year and they devoured it. yours looks quite tasty! 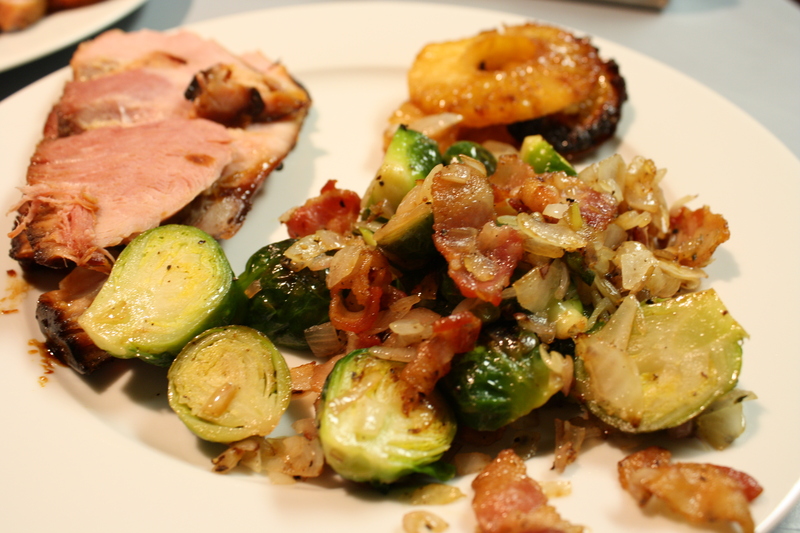 I love brussel sprouts and probably have every recipe using them. I cannot believe that I hated them most of my life. It’s funny, I’d never even HAD brussel sprouts as a kid. I don’t know why. We just never ate them when I was growing up. The first time I’d ever had them was about three years ago when Michael took me to a nice restaurant and my steak came with sprouts. I had no idea if I even liked them. They were just “okay” but nothing I wanted to have again. 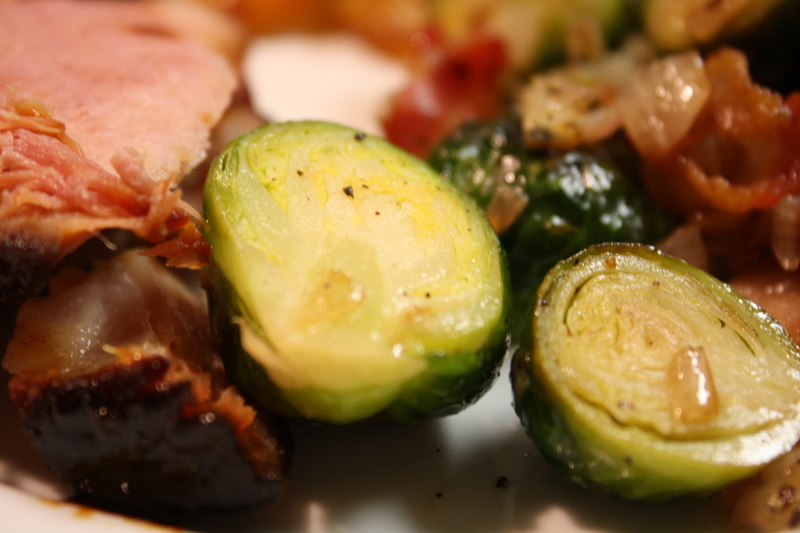 It wasn’t until recently when I had some pretty exceptional brussel sprouts that I decided I loved them! I made my first ham for Christmas this year and it turned out great. I think I saw you post about being worried about messing it up on Twitter… lol. Now you know how easy it is! Sounds like you guys had a great NYE! Yeah I was worried!! Something that big could go terribly wrong…..but it turned out really great! I have cooked 5 or 6 hams, but not eaten any of them! A mom’s club I was a member of gave them to new moms, and I was in charge of getting them to the new moms. 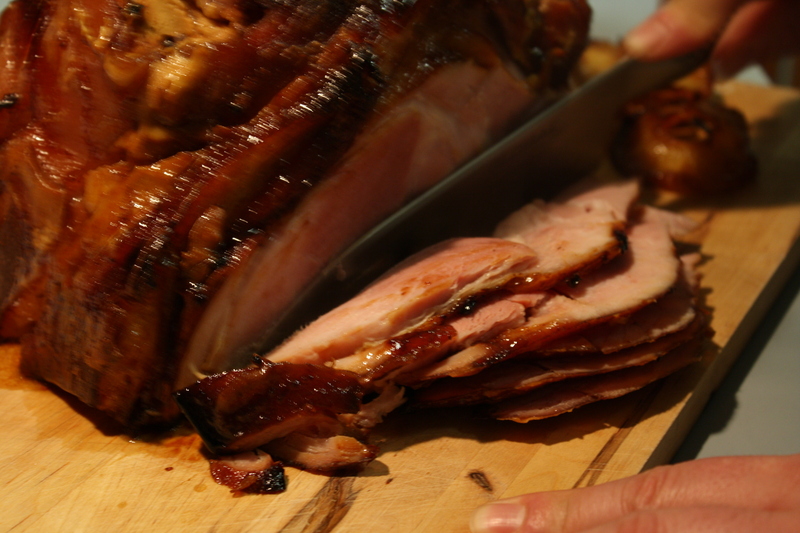 Everyone said they were delicious and many said they had never cooked a ham, but cooking hams isn’t too hard. I bought the spiral cut versions that come with the seasoning packet of brown sugar and the spices attached. All you had to do was add water to the seasoning packet, cook the sauce for a few minutes then slather it on the ham and bake it in the oven. I prefer pineapple and mustard, like you did yours, along with the brown sugar and spices. I’ve also seen people slather them with Heinz 57 sauce and cook them. My husband doesn’t like ham 🙁 so it is a treat I enjoy away from home. It’s too bad since we are now living in the current pork capital of the US! Your meal sounds absolutely delicious!! 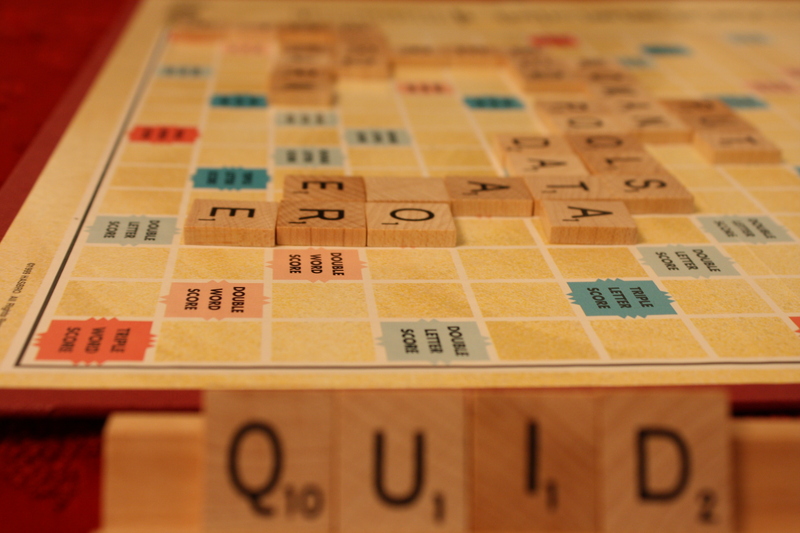 Were you able to claim victory in the intense Scrabble game?? That’s great that you gave hams to new moms! What a fantastic idea. I will have to keep that in mind. You know, I hated ham my entire life (but loved bacon) until a few years ago. My friend made the honey baked ham with pineapples and cherries and I had one bite and was converted. So glad too! I laughed at you playing with the cat and the camera while Michael made his scrabble move. Know what?? In our house, I’d be the one staring at the board while my husband would be playing with OUR cat and camera. Too funny!!! $5 for a great wine??? Our wine here is Canada is hit with a zillion taxes….I’m envious of your vino bargains!! Have a wonderful Friday. 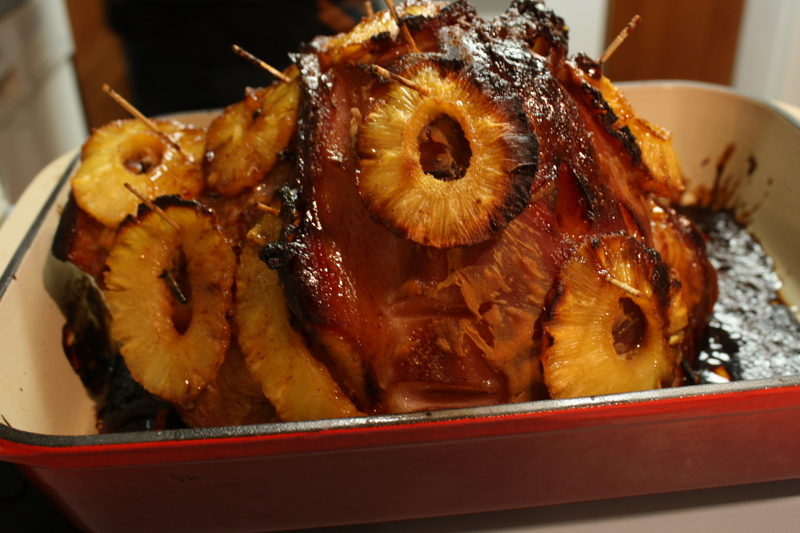 That ham doesn’t look horrifying, it looks amazing! I made a ham for our first Easter together using my friend’s dad’s OJ-balsamic glaze. Deee-lici-ous! I would love your recipe, Ashley!